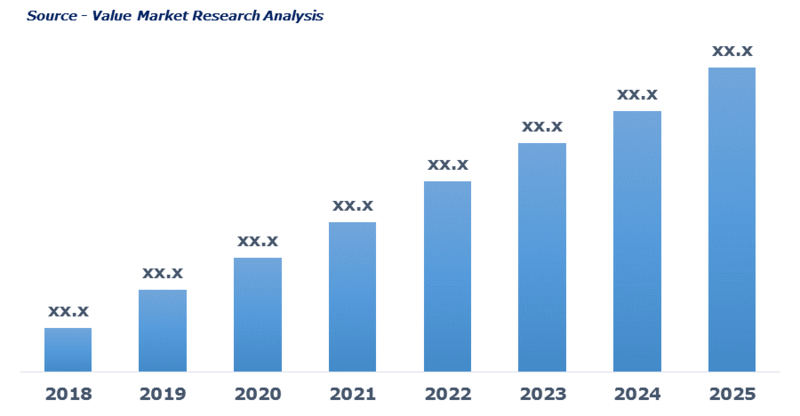 The market is expected to witness substantial growth owing to growing awareness regarding protein benefits among the potential population. Growing count of health-conscious population has increased the demand of protein supplements. Increasing obese population at an alarming rate along with high demand from athletes and sports persons is further pushing the market growth. Increase in fitness and wellness centers is spurring the market growth. The latest report by Value Market Research expects the Global Protein Supplement Market to reach USD 24.7 billion by 2025. It was valued USD 16.4 billion in 2018. The report foresees a 6% CAGR from 2019 to 2025. In 2018, protein powder dominated the segment owing to their longer shelf life. Powders are a more economically efficient alternative over the ready to eat and ready to drinks, as they do not need refrigeration, which has definitely supported the segment growth. Also, the advantage of powders is it can be easily blended with a variety of ingredients such as dry fruits, fruits, milk, and other supplements is further boosting the demand of protein powders. By source, whey led the segment by accounting maximum market share. Whey supplement aids in muscle toning, building and weight loss, is driving its demand from sportspersons and health conscious population. The growing trend of bodybuilding, mass building, muscle strengthening has contributed to segment growth. On the basis of dosage form, animal led the segment by accounting major market share. Animal protein offers advantages such as readily absorbed, easy availability and high content of the proteins essential for a human body is driving the segment growth. Along with proteins, animal derived supplements provide other essential nutrients such as vitamins, iron, zinc, etc. other than proteins is again favoring the segment growth. In 2018, supermarket and hypermarket led the application segment and has accounted for maximum market share. The ongoing expansion of organized retail chains such as hypermarket and supermarkets is the major factor driving the segment growth. Geographically, North America has dominated the market in 2018. The growing number of athletes, sports person, and health-conscious population is driving the regional market growth. Increasing count of the population suffering from overweight and obesity is also generating demand for protein supplements. Abbott, AMCO Proteins, Glanbia plc, Hormel Foods Corporation, MusclePharm Corp, NOW Foods, Post Holdings, Inc., QuestNutrition, RSP NUTRITION, and Transparent Labs are the major players of the market. As per this study, the Global Protein Supplements Market was valued USD 16.4 BN (by revenue) in 2018 and is anticipated to reach USD 24.7 BN by 2025 with a CAGR of 6%. Protein supplements are an important protein source, which is obtained from animals or plants products such as eggs, dairy, soybeans, and others. These are high in demand among those who manage weight, are health conscious, and exercise regularly. Protein supplements are also beneficial for post-surgery (especially bariatric surgery) for the speedy recovery of the patient. Global Protein Supplement Market is mainly driven by the rising number of health & fitness centers and an increase in health-related awareness amongst consumers. Increasing obesity rates indicative of a rise in demand for weight management along with the growth in disposable income are the major factors fueling the industry growth. Increasing consumer focus on leading healthy & active lifestyles and maintaining a healthy diet is again expected to fuel market growth. Moreover, the rising adoption of high protein diet as a part of weight management is further expected to propel the demand of the product. This detailed market study is centered on the data obtained from multiple sources and is analyzed using numerous tools including porter’s five forces analysis, market attractiveness analysis and value chain analysis. These tools are employed to gain insights of the potential value of the market facilitating the business strategists with the latest growth opportunities. Additionally, these tools also provide a detailed analysis of each application/product segment in the global market of protein supplements. The broad protein supplements market has been sub-grouped into product, material, source and distribution channel. The report studies these subsets with respect to the geographical segmentation. The strategists can gain a detailed insight and devise appropriate strategies to target specific market. This detail will lead to a focused approach leading to identification of better opportunities. Furthermore, the report comprises of the geographical segmentation which mainly focuses on current and forecast demand for protein supplements in North America, Europe, Asia Pacific, Latin America, and Middle East & Africa. The report further focuses on demand for individual application segments in all the regions. The report also covers detailed competitive landscape including company profiles of key players operating in the global market. The key players in the protein supplements market include Abbott, AMCO Proteins, Glanbia plc, Hormel Foods Corporation, MusclePharm Corp, NOW Foods, Post Holdings, Inc., QuestNutrition, RSP NUTRITION, and Transparent Labs. An in-depth view of the competitive outlook includes future capacities, key mergers & acquisitions, financial overview, partnerships, collaborations, new product launches, new product developments and other developments with information in terms of H.Q.